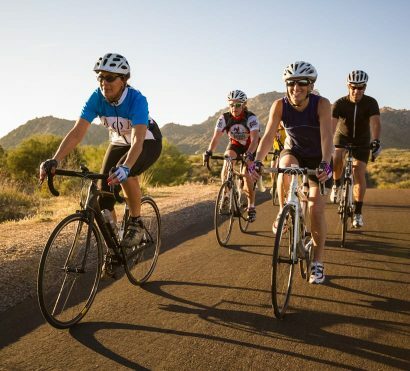 Mild winter temperatures and warm spring weather make Arizona the perfect destination for cycling trips. 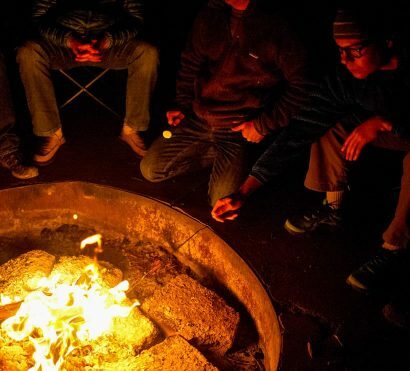 Spend four days road cycling and camping in the heart of the Sonoran Desert on this bike adventure. 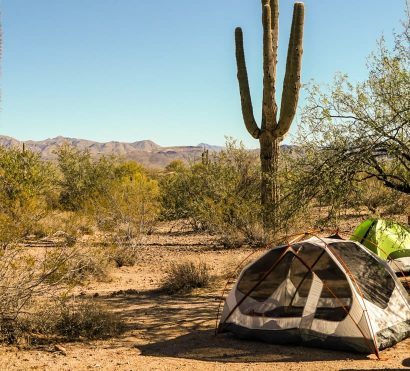 Camp out under stars as we cycle point to point between campsites, transitioning from the lush riparian environment along the Salt River to the foothills of the McDowell Mountains. Springtime temperatures offer waves of stunning wildflowers among an ocean of vibrant green cacti and warm days of riding followed by cool quiet nights. This trip offers the excitement of adventure touring, without the commitment of buying expensive new gear and a touring bike, and removes the challenge of route planning. It’s perfect for the cyclist who wants more adventure but is still looking for some of the creature comforts they are used to in their road cycling holidays. Bike rental is available through AOA (see rates below). From gentle rolling hills to punchy climbs, the variety of terrain offered in this desert will surprise you. 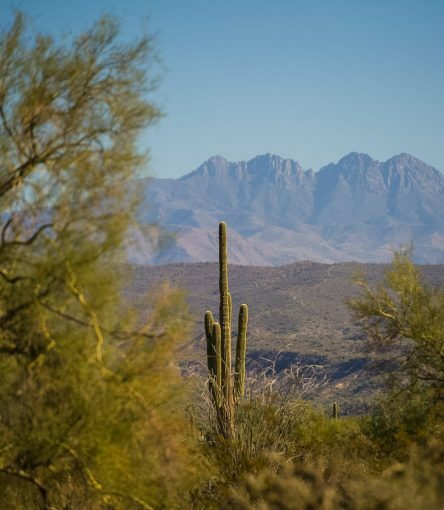 Experience the most scenic parks and portions of central Arizona from two wheels on this four-day road cycling tour through the Sonoran Desert. Each day will bring a couple of hours in the saddle with plenty of options for shorter or longer rides so you can make this bike adventure exactly what you need. From gentle rolling hills to punchy climbs, the variety of terrain offered in this desert may surprise you. Wholesome guide prepared meals and professional ride support will let you focus on and enjoy the riding; we’ll take care of the rest. Trip End: Finishes in Scottsdale, AZ between 4-6pm on day 4. Meet your guides and fellow riders at our host hotel in the heart of Scottsdale, Arizona. After a quick meet and greet we’ll transfer via van to Usery Mountain Regional Park where we’ll begin familiarizing ourselves with our bikes and camp. AOA has options for rental road bikes or a more casual trek touring hybrid, or you may choose to travel with your own bike. After getting our bikes fitted and gear dialed in, we will set out for a 20-mile loop that takes us through the outskirts of Tonto National Forest and along the Salt River. We’ll tackle a brief climb, Usery Pass, before heading back and settling into camp for the night. 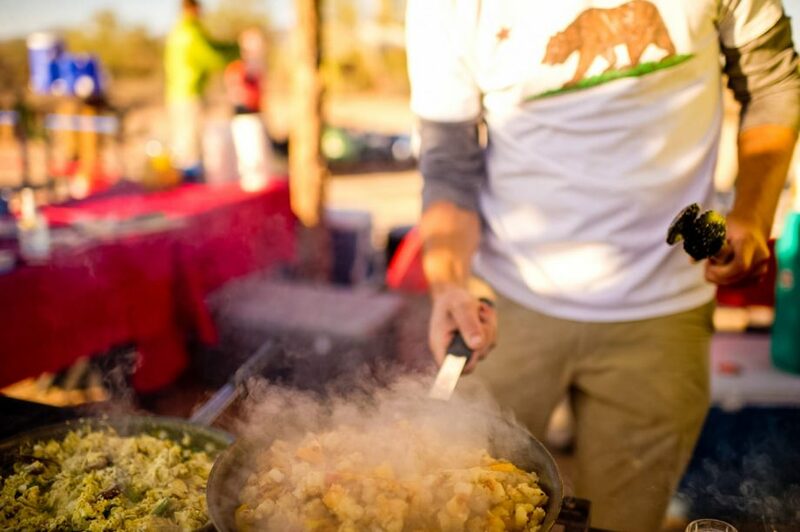 As your guides prepare a delicious meal to fuel the following days of journey-style road riding, you can put your feet up and prepare for a road cycling adventure through the heart of the Sonoran Desert. The first full day of our touring journey begins with breakfast for a healthy day in the saddle. We’ll descend Usery Pass and follow the Salt River upstream where wild horses and other wildlife are commonly spotted. 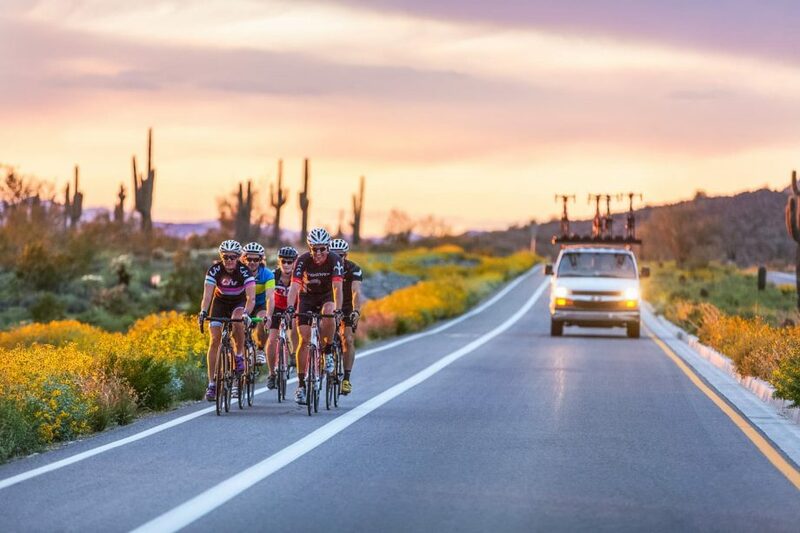 This ride will take us past the historic Saguaro Lake Ranch for an exciting climb out of the Salt River Canyon, onto land owned by the Salt River Pima-Maricopa Indian Community, and through the town of Fountain Hills. As we approach our next camp, McDowell Mountain Regional Park, rolling hills turn into more gradual, drawn out climbs. Eat and rest up tonight as tomorrow is our longest day of this road cycling tour. 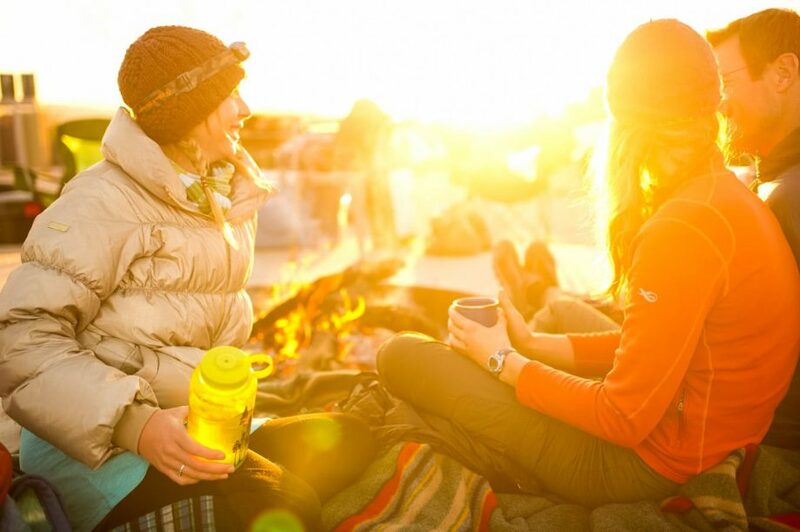 Wake up surrounded by rugged, rocky mountains and rise from our comfortable basecamp, starting the day with a hot pick-me-up and breakfast. Today, our bike trip takes us west over 50+ miles of varying terrain. 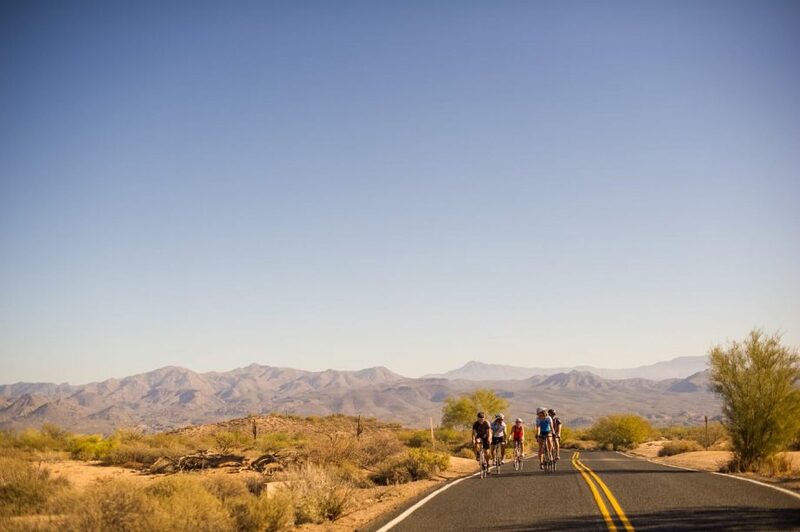 From “9-mile climb”, as the locals call it, to the pristine pavement of Sonoran Desert Drive, this route allows you to roll along some of the best roads in the Sonoran Desert while sinking into the rhythm that adventure cycling offers through point-to-point touring. With plenty of support and encouragement along the way, we’ll arrive to our final camp with time to relax over a hearty dinner and exchange stories from our day in the saddle. 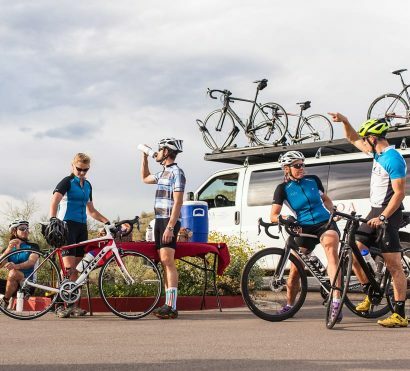 The final day of your road cycling trip brings the route through the towns of Cave Creek and Carefree, Arizona, throwing one moderate climb at you to finish out a wonderful four day cycle tour. We’ll head south and descend on smooth and flowing roads to a scenic picnic lunch prepared by your guide. As the day begins to wind down we’ll return to our Scottsdale host hotel and conclude our journey of road cycling through the Sonoran Desert. Electricity: During this trip there will be limited access to electricity. We recommend bringing a portable battery pack to charge your phone for photos. Showers: Hot showers are available each day of this trip, but camping at the end of a long day of riding inevitably pushes us outside of our comfort zone. On this trip we camp in public campgrounds that allow us to ride point to point on some of Arizona’s best roads. We select sites with the best privacy, but we may have other travelers as neighbors. On this trip we will move to a new camp each day, your luggage will be transferred for you, but you will have to help settle your personal things in each night.